Shropshire Speakers is one of 400 UK public speaking clubs affiliated to Toastmasters International. However, there is so much more to Shropshire Speakers than just delivering speeches. As a member of the Club, you are given the opportunity to develop a whole range of different skills by taking on different roles at each meeting. One of the best ways to hone your listening skills is to be GRAMMARIAN for the evening. 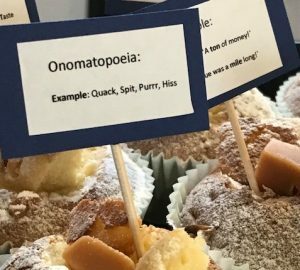 At our last meeting, Club member, Denise Beaumont, was an excellent Grammarian and gave a deliciously sweet twist to the Grammarian role by producing a freshly baked batch of ‘Grammar Cakes’ to help illustrate different grammatical devices that we can all use to enhance our speeches. Denise commented, “I feel I learn a wealth of information in the short time we get together and always feel learning should be filled with as much creativity as possible! The cakes are a note of thanks to the group for the inclusion as well as an edible education”. We are hoping that Grammar Cakes can become a regular feature of the Shropshire Speakers’ meetings! If you have yet to visit us, why not come along for FREE. We meet on the first and third Wednesday at Ramada Telford from 7.15pm and there may even be freshly baked ‘Grammar Cakes’! This entry was posted in Uncategorized and tagged alliteration, anaphora, communication, edible education, Grammar Cakes, Grammarian, grammatical devices, hyperbole, language, listening, metaphor, onomatopoeia, Shropshire speakers, simile, toastmasters, Toastmasters International. Bookmark the permalink.